One of my favorite recipes from the collection that I've inherited from my German grandfather is Zwetschgenkuchen, a plum kuchen that might be considered more like a fruit tart in the American way of thinking. 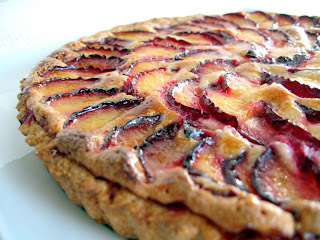 The combination of sweet-tangy plums and buttery, crisp cake is a favorite with my family, and when I found this plum tart recipe with the extra flair of an almond frangipane filling, I knew it would be something that everyone at home, especially my father with his German-schooled tastebuds, would love. I usually make traditional Zwetschgenkuchen only once a year, during the one week when the small, oval Italian prune plums (Zwetschgen) are in season and locally available. (Every summer, I keep my eyes peeled for them and pounce the moment I find out they're at Tri-County.) But with black plums as the featured fruit in this recipe, we get to enjoy plum cake a little early this year, just in time for Father's Day! This plum frangipane tart is truly delicious. The pastry dough is buttery and crunchy, the toothsome almond filling is aromatic with ground nuts and the addition of Kirschwasser, and the sweet-n-tart plums fanned out on top accent the tart with gorgeous color. You'll definitely need to try this amazing dessert this summer--either with whipped cream if you're more the traditional type, or with softened yogurt ice cream, for a fresh twist. Kirschwasser, a liqueur made from distilled cherries, is commonly served throughout southern Germany as a digestif and is an ingredient I've become familiar with through my German baking. First and foremost in my mind, it's a requisite ingredient for Himbeersahnetorte, but the almond-like overtones (due to the presence of the cherry pits during distillation) add nice complexity of flavor to glazes and fruits as well. Here, I've incorporated it into both the frangipane filling and the glaze that is brushed over the top of the sliced plums after baking. To make the crust, mix flour, sugar, and salt in a food processor. Add butter and blend until coarse meal forms. With processor running, add ice water one tablespoon at a time until dough forms clumps. Transfer dough onto a large piece of plastic wrap and press clumps together to form a disc. Wrap dough with plastic wrap and chill for 30 minutes. While dough chills, prepare the frangipane filling. Using the same food processor, beat together the sugar and butter until creamy. Add eggs one at a time, blending after each addition, and then mix in the Kirschwasser. Add the almond meal and mix well. Cover and refrigerate until needed. Roll out dough on the unfolded plastic wrap into a 12-inch circle. (If dough is too sticky, place another piece of plastic wrap over and roll the dough out sandwiched between the two layers of plastic.) Transfer crust to a 10-inch-diameter tart pan with removable bottom. Fold overhanging edges in and press crust into the fluted edges of the pan. Freeze crust 30 minutes. Line the frozen crust with aluminum foil and fill with pie weights (I used dried pinto beans). Bake crust at 375 F for 20 minutes, then remove foil and weights and bake until golden brown, about 25 minutes longer. Cool. Pour the filling into the cooled crust and spread evenly over. Starting at the outside edge, arrange plum slices in concentric circles over the top of the filling. 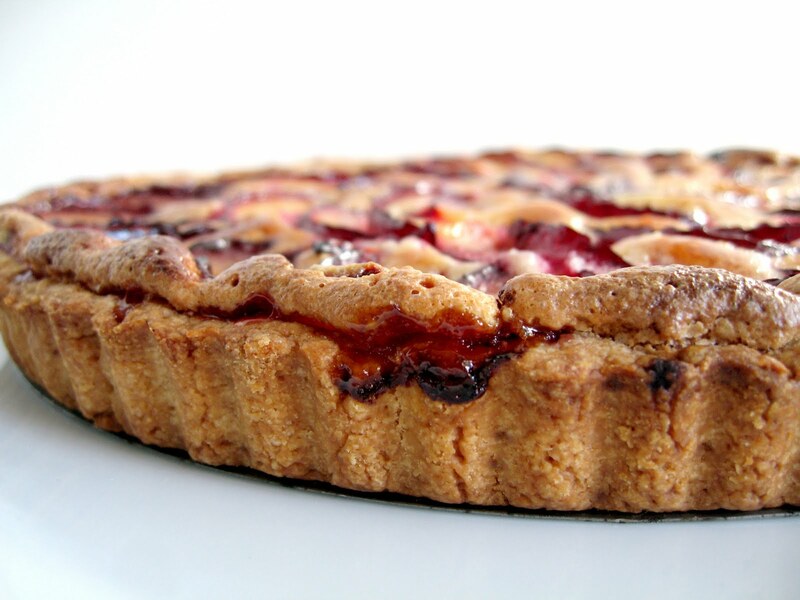 Place tart on a rimmed baking sheet and bake at 375 F for 45 minutes, until filling is brown all over and center is set. Just before removing tart from oven, prepare the glaze by heating the jelly and Kirschwasser together and stirring until liquefied. Brush glaze over the warm tart and let cool for 15 minutes before releasing it from the pan. 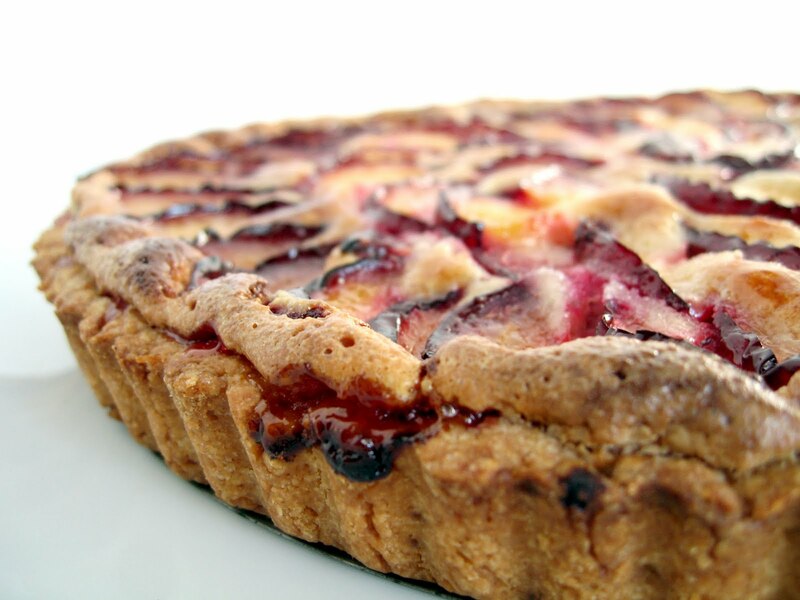 Let tart continue to cool, serving slightly warm or at room temperature. Cut tart into wedges and serve with lightly sweetened, freshly-whipped cream, or with a tart yogurt ice cream. ** If you cannot find almond flour or almond meal, it is easy to prepare it at home! Blanch 2 cups whole almonds in a large pan of boiling water for 30-60 seconds until skins have puffed up and are loose. Remove pan from heat and rinse almonds in cold water to stop cooking. "Pop" almonds out of the loose skins and pat peeled almonds dry. Pulse in a food processor until almonds are finely ground. Measure out 1 1/3 cups for use in this recipe; save remainder for another use. Beautiful plum frangipane tart, lucky dad for father's day! I just happened upon your blog. You've got great recipes. And your photos are super. Thanks guys for the nice comments! 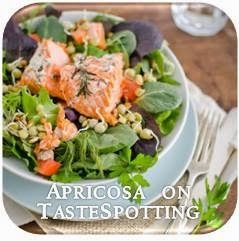 Glad to have you visit Apricosa! Lovely recipe and beautiful photographs. 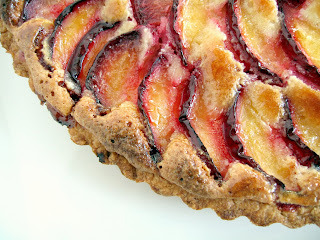 I love plums, and love frangipane, so will definitely give this a try when plum season comes around. Beautiful tart. Frangipane makes any fruit taste fantastic. I love plum pastry. The glaze sounds fantastic too! Beautiful job. Can't wait to try this one. Thanks for sharing. I love your blog and all of the assorted recipes! I'm definitely going to be cooking a lot of them.